The anusim of Spanish and Portuguese origin who began settling in Amsterdam in the 1590s adopted many customs current at the time in the Sephardic Diaspora. Though ketubbah illustration was known in medieval Spain, the tradition was lost to the anusim during the century they lived as “New Christians” in Portugal. The practice of decorating marriage contracts was revived in early seventeenth- century Amsterdam under the influence of Italian ketubbah artists. In Amsterdam in the late 1640s the noted Italian Jewish engraver Shalom Italia created a copper engraving used as the border for the ketubbot of the Portuguese community. Italia’s border subsequently inspired an unidentified local engraver to create a modified version. The new border, of which this example is one of the earliest, became the most widespread framing device for marriage contracts of Dutch Sephardim. For more than two hundred years this border adorned Sephardic ketubbot produced in Hamburg, Bayonne, London, New York, and Curaçao. The popular border consists of an arch supported by two columns entwined with floral wreaths. Sunrays and clouds appear within the arch; a pair of putti hold a cloth upon which is engraved the blessing “with a good sign.” The side borders are filled with large vases, flanked by small pots, containing Dutch tulips and other flowers in which are nestled birds and insects. Two images appear in the top corners. The one on the right depicts a young couple dressed in elegant attire; they hold each other’s right hand, a symbolic gesture of matrimony. The one on the left portrays a young, bare-breasted woman who holds a baby, while a second child stands next to her. The group personifies Caritas (Charity), a depiction popular in Baroque art in Italy and Holland. The two images symbolize the ideals of marriage and motherhood. The large ornamental cartouche at the bottom contains the special conditions common among Western Sephardim. 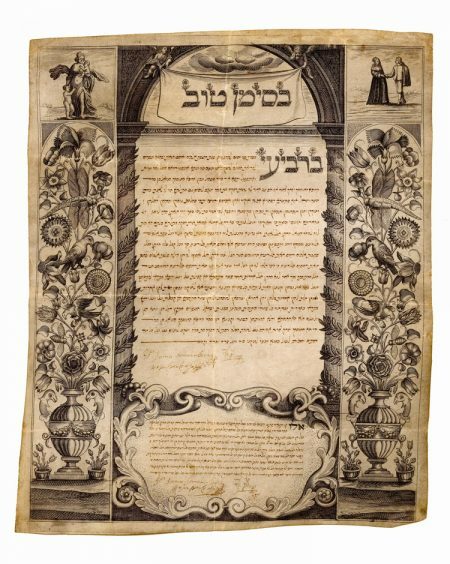 The calligraphic text commemo- rates the marriage of a known Sephardic physician, Daniel Tzemah Aboab, who was active in his commu- nity as the head of the local Talmud Torah and as a fund raiser for the Bikkur Holim Society from 1689 to 1718. Sabar 1990; Sabar 1997, pp. 250–251, 277. Dowry: 7,500 florins, coinage current in “the banks of this city,” of which 6,000 are in cash and jewelry, and 1,500 in bed linen; increment: 3,750 florins; total obligation: 11,250 florins.